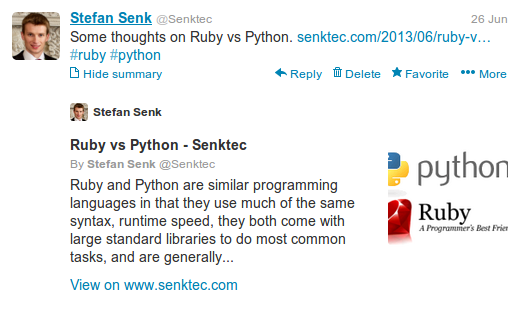 Twitter Cards are meta data added to webpage that tell Twitter information about the page’s content. Twitter uses this information when a Tweet links to your page, which enriches the tweet. The information is typically shown when the user clicks “Expand” on the tweet. It could include a summary of an article, an image, a video, product information, and more. With the Yoast SEO plugin, click on “SEO” in the admin menu, select “Social” in the sub-menu and then choose the “Twitter” tab. Check the box to enable adding Twitter meta data to your site and add the site or author’s Twitter username, if you have one. When viewing the source of a page, you should now see the Twitter meta tags appearing. If the authors have different Twitter usernames, these can be set when editing the user and the “twitter:creator” field will be populated with that username for each article written by them. Find out more about the SEO plugin at Yoast.com. Once the meta tags are in the webpage, the Twitter Validator can be used to check they’re correctly being read by Twitter. The validator is found at dev.twitter.com/docs/cards/validation/validator. Use your Twitter account to login. Before the Twitter card will show up in the tweets, the page must be validated and approved by Twitter. Click “Request Approval” for the correctly validating card to send the card for approval by Twitter. Each different card type used on the site must be validated and claimed for the domain. You’ll get an email back from Twitter when the card has been approved. This can happen quickly, but may take a couple of weeks. Posted on 12/07/2013 by Stefan Senk. Posted in General, Tech. Tagged html, twitter, wordpress.